The most popular diamond shape is the round brilliant. It has an arrangement of fifty-eight facets, which cause the light beams to bounce from the pavilion back through the crown. The size of a diamond is measured in carat weight. A carat is equivalent to 0.2 gram. Paradoxically, the term clarity is mainly used to refer to the flaws in a diamond. The Internally Flawless Grade (IF) describes diamonds which have no internal characteristics, but which have minor surface blemishes that do not penetrate the stone. The VVS1 & VVS2 grades (Very, Very Slight Included) are used to describe diamonds which have very, very small inclusions. 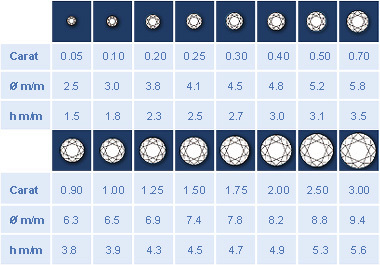 The VS1 & VS2 grades (Very Slight Included) are used to describe stones with very small inclusions. The SI1, SI2 & SI3 grades (Slight Included) are used to describe stones with small inclusions. The I1, I2 & I3 grades (Included) are used to describe stones with medium or large inclusions. Diamonds are found in a range of colours, the rarest being colourless or fancy colours such as greens, blues and reds. A letter is assigned to a colour grade. The colour grading scale begins with D, the best colourless stone, to Z. Good stones range from D through I. On the opposite end of the spectrum, yellow and pink diamonds have their own grades. Adjectives are used to describe the degree of colour, otherwise known as saturation.